We were fortunate enough to have a demonstration from a nito 7th dan who showed us that the opponent’s shinai needs to be totally suppressed by the daito and that the nito player’s body should be completely square on to his opponent as he makes the strike. He also made the point that he had never received or seen ippon given for a strike made with the kodachi. With gyaku dou it was emphasised that as well as striking the correct part of the dou (the left side), with the correct part of the shinai (datotsu bu) and with the correct hasuji i.e. striking the target with the bottom take, it was imperative that the attacker step back in a straight line after hitting. The logic being that if he steps to his right or crosses abruptly to his left in front of the opponent this does not constitute a natural path for a pulling cut or hikigiri. This was in the broader context that all yuko datotsu should be considered with reference to “The Principles of the Sword”. So the instruction was to consider posture and zanshin carefully along with bu, bui and strength of strike. Another point of discussion was that bad behaviour in and around the shiai-jo should be dealt with promptly. Hansoku should be applied as per the rule book and in cases of severity, for instance where a combatant refuses to return to the kaishi sen, taijo (disqualification) should be used. Reference was also made to supporters’ behaviour and that encouragement should be limited to (non-rhythmic) clapping. The fact that 56 of FIK’s 57 countries are attending, (I did not ask who the no-shows were!) was mentioned several times. This obviously means that the schedule for the whole 3 days is going to be very full. Please competitors and coaches get to the right shiai-jo at the right time, or we will all be in the Budokan until midnight. 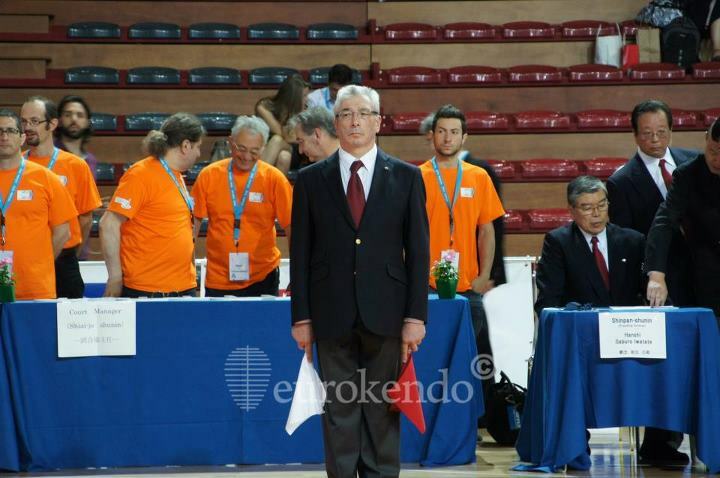 I wrote this half way through the 16 WKC referees seminar, where 36 of us from 16 countries were being gently reconstructed in the interest of refereeing perfection. This year the action takes place in Narita High School which has some of the best kendo facilities I have seen. 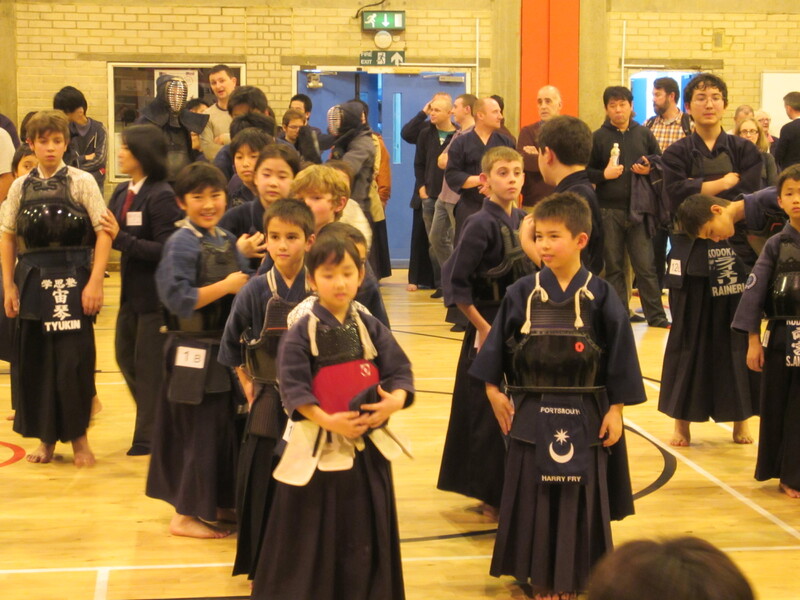 The shiaisha for the practice matches came from the 5 top kendo universities in the Kanto area – and they are fast. Trying to keep up with the speed of the succession of renzoku waza they produce feels like refereeing in fast forward. 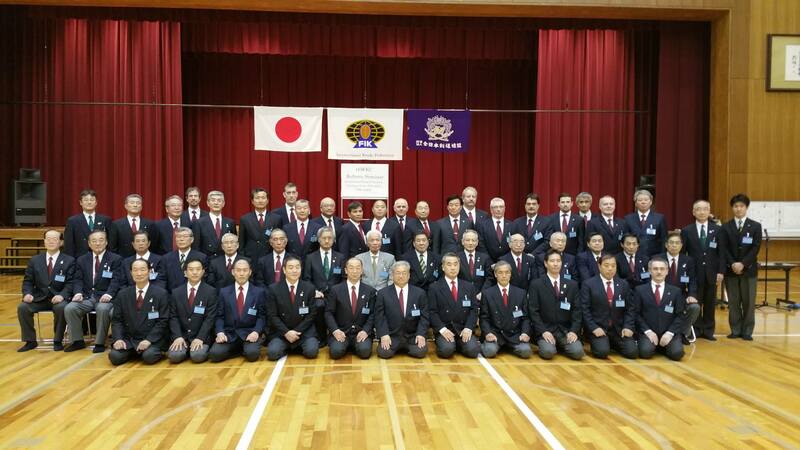 The instructors in charge of the seminar were Sato Nariaki sensei and Kakehashi sensei and the referee’s theme for the event is 16CWKC. The C stands for clean, stressing, clean, sharp technique and correct shiai behaviour. A considerable amount of time was spent on examining the various elements of successful and unsuccessful yuko datotsu. This was particularly illuminating for gyaku dou. I was also shown the answer to a question that has been a mystery to me for years. When can a into player score ippon with the kodachi? One very interesting fact came out of the opening address. 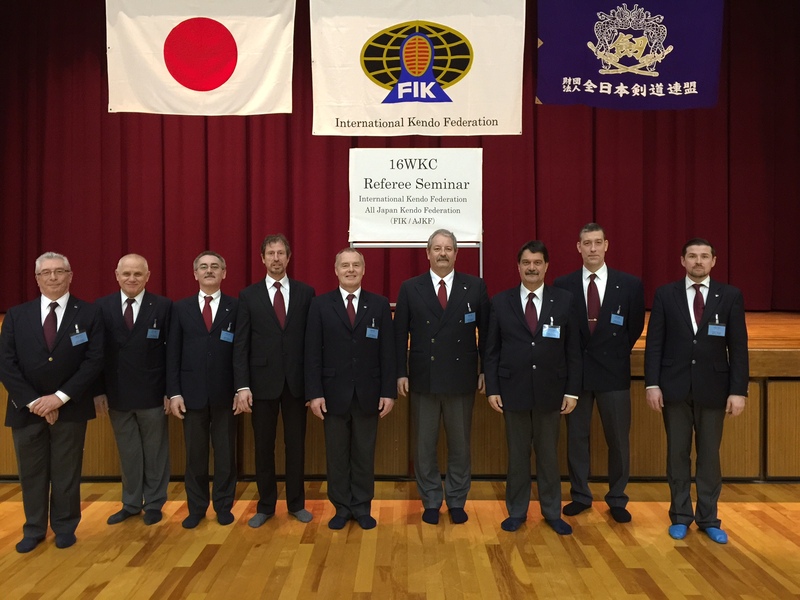 56 of the 57 IKF member countries are coming to the event in May.This is going to be the biggest kendo ever! With 3 days of men’s and women’s individual and team events on four courts the referees are going to need their vitamin drinks. Excuse the brevity and typos, but fat kendo fingers and mobile devices are not natural partners. I will do my best to outline some of the key points in my next post. Why be a kendo referee? I like blogging on WordPress. They have a useful stats page that not only tells me who is looking at my blog but how they found it. Last Monday I happened to glance at the list of search terms used to find me and the one that stood out was “what’s the point of being a kendo referee?” Fresh back from two days on a busy shiai-jo in Paris, this struck me as being a very good question. It is not always advisable to read search strings literally, but I perhaps uncharitably took the meaning to be “refereeing, what’s in it for me?” which is indeed worth exploring. I have been a referee for quite a few years now, originally at domestic level then subsequently at European and World Championship level. My original motivation was simply that “if I don’t do it and everyone else feels the same, we can’t have a taikai.” As time has gone on however, I see it as very much an integral part of my kendo training and try as hard to improve my refereeing skills as I do my ability in keiko. 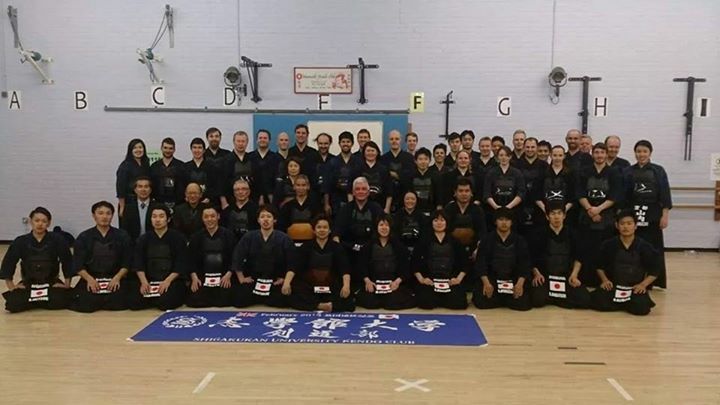 Looking at the question from another angle, we know that the requirement for a kendo referee is that he or she needs to regularly practice kendo and be at a technical level at least equivalent to the players. If you can’t do a technique yourself, then how can you judge it when it is done by others? Given that a referee meets these criteria, refereeing can teach you a lot. It teaches you to anticipate movement, as you need to think ahead of the players and be able to position yourself in the right part of the court before they move there. It teaches you about enzan no metsuke, as you need to be aware of the players, your fellow referees and the court boundaries at all times. It teaches you about distance, timing and opportunity as these are the key elements of successful yuko-datotsu. It teaches you about ki-haku, kiai and zanshin – without which a point is not valid. Finally it teaches you to keep a still mind. You need to be able to react instantly to a strike, foul or signal from another referee or the timekeeper, but only after you have evaluated all the information. To do this without premeditation or bias, your mind has to be clear, like the proverbial kendo mirror. 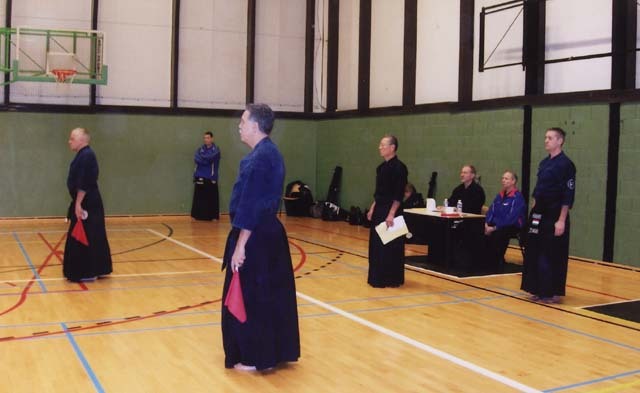 I find that after refereeing at a tournament I try techniques that impressed me at the time and try to correct faults I saw that prevented the competitors from making successful attacks. My advice to anyone above third dan is to attend your next local referee seminar. If nothing else you should have a good laugh at some of your mistakes and those of your colleagues. Who knows? you may decide that you get as much as you give by becoming a referee.